John Cochrane wrote a blog post criticizing the Obama administration's new rule extending overtime pay to low-paid salaried employees. Cochrane thinks about overtime in the context of an Econ 101 type model of labor supply and demand. I'm not going to defend the overtime rule, but I think Cochrane's analysis is an example of what I've been calling "101ism". Well, which is it? A wage floor, or a negative labor demand shock? The former makes wages go up, while the latter makes wages go down, so the answer is clearly important. If using the 101 model gives you two different, contradictory answers, it's a clue that you shouldn't be using the 101 model. In fact, overtime rules are not quite like either wage floors or negative labor demand shocks. Overtime rules stipulate not a wage level, but a ratio between base wages and wages paid on hours worked per worker above a certain amount. In the Econ 101 model of labor supply and demand, there's no distinction between the extensive and the intensive margin - hiring the same number of employees for fewer hours each is exactly the same as hiring fewer employees for the same number of hours each. But with overtime rules, those two are obviously not the same. For a given base wage, under overtime rules, hiring 100 workers for 40 hours each is cheaper than hiring 40 workers for 100 hours each, even though the total number of labor hours is the same. That breaks the 101 model. With overtime rules, weird things can happen. First of all, base wages can fall while keeping employment the same, even if labor demand is elastic. Why? Because if companies fix the hours that their employees work, they can just set the base wage lower so that overall compensation stays the same, leading to the exact same equilibrium as before. Overtime rules can also raise the level of employment. Suppose a firm is initially indifferent between A) hiring a very productive worker for 60 hours a week at $50 an hour, and B) hiring a very productive worker for 40 hours a week at $50 an hour, and hiring 2 less productive workers at 40 hours a week each for $25 an hour. Overtime rules immediately change that calculation, making option (B) cheaper. In general equilibrium, in a model with nonzero unemployment (because of reservation wages, or demand shortages, etc. ), overtime rules should cut hours for productive workers and draw some less-productive workers into employment. In fact, this is exactly what Goldman Sachs expects to happen. Now, to understand the true impact of overtime rules, we probably have to include more complicated stuff, like unobservable effort (what if people work longer but less hard? ), laws regarding number of work hours, unobservable hours (since the new rule is for salaried employees), sticky wages, etc. But even if we want to think about the very most simple case, we can't use the basic 101 model, since the essence of overtime rules is to force firms to optimize over 2 different margins, and S-D graphs represent optimization over only 1 margin. Using 101 models where they clearly don't apply is 101ism! But given that the overtime rules' proponents don't even pretend to justify them using a more sophisticated model that takes into the account the factors you mention, are they not guilty of 000ism? Plus of which, I defy you to come up with such a sophisticated model that would have convincing empirical support. We just don't understand the labor market in that much detail, AFAIK. Part of what makes the 101 models 101 models is that their basic logic is so convincing that even if they don't literally apply to any individual worker's situation, we expect them to have some relationship to the truth when integrated across the various margins that are relevant to the real world. And if you search your soul about your true priors, do you really believe either (a) there is no deadweight loss from overtime rules, or (b) any losses will be borne by employers rather than employees, in equilibrium? Assuming neither of those is the case, how can you support the policy in the absence of some sort of empirical evidence that it will have a net positive effect (according to your own sense of net social welfare)? But given that the overtime rules' proponents don't even pretend to justify them using a more sophisticated model that takes into the account the factors you mention, are they not guilty of 000ism? Sure, but I think if you fight "no model" with bad models (or bad applications of otherwise good models), people might nod along for a little while, but ultimately you just end up discrediting the profession and the whole notion of economic modeling. Then the 000ers get the complete run of the place (if they don't have it already). Plus of which, I defy you to come up with such a sophisticated model that would have convincing empirical support. We just don't understand the labor market in that much detail, AFAIK. Well, I think that's true, but in this case, it's not even empirics, just basic logic, that says overtime rules aren't either of these classic 101 cases. Part of what makes the 101 models 101 models is that their basic logic is so convincing that even if they don't literally apply to any individual worker's situation, we expect them to have some relationship to the truth when integrated across the various margins that are relevant to the real world. Well, not here. If overtime is a wage floor, wages go up. And policymakers might choose the policy because they want to make wages go up, and they aren't as worried about unemployment. But if overtime is a negative demand shock, the story flips - you can't just "integrate across various margins". And if overtime raises employment, like Goldman predicts, that's important too. And if you search your soul about your true priors, do you really believe either (a) there is no deadweight loss from overtime rules, or (b) any losses will be borne by employers rather than employees, in equilibrium? Oh, I don't know, I'm sure there's deadweight loss, but it might be tiny compared to changes in welfare and distribution, which is what I think policymakers usually really care about. I kind of think the idea that base pay rates will be cut to accommodate overtime is an idea that has more appeal to economists than employers. I have been a salaried employee at just above the OT-exempt minimum for a while now and it seems pretty clear that part of the appeal for my employer is that the cost to employ me has a hard ceiling. I find it unlikely they'll want a situation where they're paying less in base, but risk paying me an "unlimited" amount if they need me to work a lot of hours. John isn't allowed to think through possible ways that the complex rule plays out? If it is more like a wage floor, something will happen. If it is more like an increased marginal cost, something else will happen. That seems like a legitimate conceptual exercise. In this case, both models suggest a decrease in Q.
I pointed out in responses to Cochran's post that it was simplistic economics 101: thanks, Noah, for explaining exactly why. 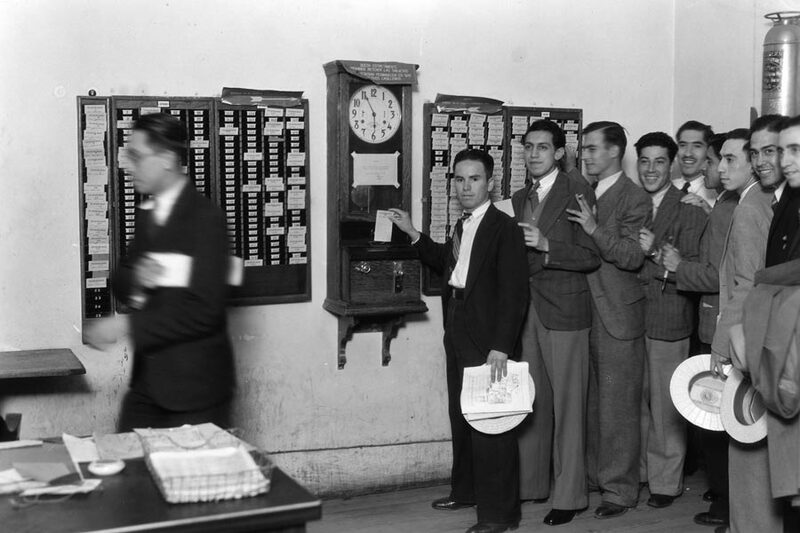 Overtime helps match opportunity costs for workers (which you ignore in this post) with wages. As time worked per week increases, so do opportunity costs. Unpaid overtime means that as time worked per week increases, average wage decreases. I found the same idea in a review of The Economics of Overtime Working by Robert A. Hart. "First, governments may attempt to reduce the health and social costs of excessive work demands by imposing high labor costs on firms’ marginal daily or weekly hours beyond acceptable norms. Second, labor unions may require high marginal rates as compensation for potential adverse effects on their members’ welfare." The negative demand shock makes sense if you think of overtime pay in a similar fashion as an excise tax: then there are two wages, the wage before overtime pay (which goes down) and the wage plus overtime pay (which goes up). Good example of how things aren't as simple as Econ 101 makes them seem. Looking for Johns response. Noah, I wonder if Mike Huben and Holy Insect both have it right, and also that there's a simple model for this - but I have no idea what it is (forgive me, Econ 101 was a very long time ago). I'll take a shot at it, though. For the sake of simplicity, assume that productivity per hour is constant. I'm also assuming that the amount of work output needed per week is fixed. Under prior law, a salaried employee was a fixed cost, so generally speaking, the longer he could be forced to work, the less the cost per hour. Realistically speaking, there's about 60 hours as a limit per week before people start quitting. So, the true cost per hour for each employee is weekly salary/60 rather than weekly salary/40. The model in this case should show that the optimum least-cost option for a fixed amount of production is having all workers as close to 60 hours/week as possible. So, what I'm envisioning in this case is that as hours/worker approach 60, demand for workers increases significantly, but is fairly flat until then. Under the new law, the cost per hour goes up rather than down as hours per employee goes over 40. So, in this case, as hours per worker increase over 40, demand for workers starts increasing at a much faster rate. The implication of this, to me, is that Goldman Sachs is absolutely correct - demand for additional workers should increase substantially. But, from a corporate point of view, this represents a huge increase in the cost of labor. I would expect, in this case, that there's be a strong preference towards hiring many more employees at lower salaries with a strict prohibition against working more than 40 hours/week. It also wouldn't surprise me at all to hear that the salaried employees who used to work many more than 40 hours/week on a fixed salary are being to forced to accept substantially lower base pay such that their hours worked and total compensation don't change. In my minds eye, I can see graphs of this, but have zero idea how to put them on paper. I think you're missing Cochrane's point, as well as the application of the models. The point is, given various potential labor market conditions, what we can conclude is that these overtime policies will affect the quantity of labor demanded, but the effect on wages is ambiguous. It's not unreasonable to think of mandated overtime pay as acting as a price floor in one industry's market for labor and simultaneously acting as a negative demand shock in another. But with overtime rules, those two are obviously not the same. For a given base wage, under overtime rules, hiring 100 workers for 40 hours each is cheaper than hiring 40 workers for 100 hours each, even though the total number of labor hours is the same. That breaks the 101 model. ^That doesn't seem right to me. Sure, if you held the base wage constant in both cases it's correct. However, given a single supply curve, you'd have to offer a higher base wage for those extra 60 workers to even be in the market for labor, which ends up costing more (if not the same) than hiring 40 workers for 100 hours. Hopefully that made sense, because it's hard to articulate without using a whiteboard and graphs to demonstrate visually. The largest effect will be an increase in productivity since many of those hours employers never paid for will no longer be worked. That and an increase for those just below the cutoff to remove them from it. Actually it wouldn't apply to anyone in your examples for full time workers since the cutoff would be about $24/hr. In the long run you're mostly right, in addition some workers will get some of the overtime pay as the business will find that the marginal cost of paying for some of those hours lower than either not doing the work or hiring the extra workers. Given that searching & matching is time consuming, the initial impact will be mainly on the current workers and whether the business values the overtime work currently being done more than the new cost. 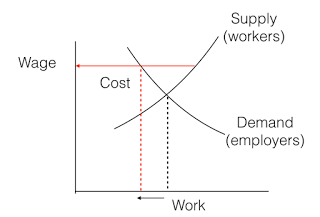 My objection to Cochrane's analysis (and similar analyses such as by Sumner on Econlog) is not in the details of the labor supply & demand graphs, but rather in the assumptions that underlie the analysis: marginal costs of labor and their interaction with efficient competitive markets. I don't at all disbelieve in those ideas. But I think there are really important larger scale macro & social effects that have driven reduced labor share and increased corporate profits over the last generation. These include decrease in unions, technological improvements in tracking of workers, increased use of non-compete agreements, increased use of contractors in place of employees, and treatment of some employees as 'managers' so that they can be coerced into working extra hours at no cost. The change in overtime regulation is a way to push back against the last of these. In Cochrane's vision of the economy these effects (unions, etc.) don't really apply - every employee is simply paid his marginal product, or should be at any rate, and would be if government regulations didn't gum up the works. But the real issue is the relative power relations between employees and employers, and how much of the considerable profits of most businesses are shared with labor. I want to add the observation that hiring more workers at >30 hours per week = big increase in what employers are paying in benefits, so that factors into the decision too. I am not very knowledgeable about economics at all, but it seems to me that this makes the analysis even more complicated. Cochrane doesn't understand macro at all, and this is actually a macro problem not a micro problem. Right off the bat Cochrane assumes that people need more choice, more flexibility, that if everyone is just 100% free the market will work things out. Cochrane mentions the classic analysis of minimum wage, saying that if you raise the minimum wage you get less jobs. This is absolute, total nonsense that only a microeconomics professor living in the cognitive dungeon of neoclassical views could hold to. In a closed economy, if you raise minimum wage you simply drive up the price of some things, but it also drives up the aggregate wage level which offsets the price increase. If wage floors always cause an aggregate loss of labor, then why did the economy hum along just fine in the 50s with a minimum wage higher than $15 in real terms? Cochrane does not understand macro. That is the problem. Oh, and you somehow have figured it out? Seems unlikely, internet tough guy. Before, workers had the flexibility to do what they were told or find a new job. They still have that flexibility. Even more so as this will increase demand somewhat as well as the flexibility that comes with more pay from overtime though this will be very limited. Mostly they will have greater flexibility by not having to put in unpaid hours so will have more free time. Wage rigidity prevents them from being cut for the most part. The real diminution of flexibility is that of employers who will no longer be able to treat those hours as the zero marginal cost for salaried or linear marginal cost for hourly that they were. These costs being closer to social cost will improve efficiency and productivity. In an economy with inflation too low, this will tend to increase it as some of these costs are passed on, also increasing dynamic efficiency. People are missing the point. This doesn't actually change the overtime rules (which apply to EVERYONE no matter the salary) but at what wage it is assumed the excluded categories of people work. I have a friend who makes near $100K for a Defense contractor in IT and is almost certainly working overtime and not getting compensated for it because I expect the company doesn't think he will ever complain. (which he won't). The rule is pretty simple, if you make under 40% of the median wage it is automatically presumed you are not the type of employee covered by an overtime exemption. Also, if you make over $100k you only have to have some small amount of exempt tasks to qualify. Otherwise the only exempt categories are the standard executive, administrative, or professional. This is basically Executives, Managers in offices, and people with higher degrees (Doctors, Lawyers, CPA's, PHd's, etc...). So the law isn't changing and the idea that some there is this big group of exempt managers who make less than $51k a year seems kind of ridiculous. I would assume those would be retail and restaurant general managers who are most effected.